Skybound's standard trampoline mats are a direct replacement for your tired, worn-out trampoline mat and designed to meet or exceed your manufacturers original trampoline mat's specifications and are guaranteed to ensure a perfect fit. 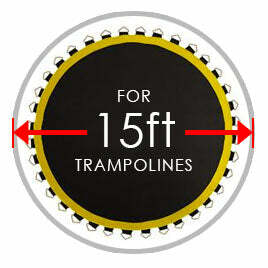 These replacement trampoline mats feature eight rows of heavy duty stitching, a tightly woven polypropylene jumping surface, and an industry leading warranty. Since a precise fit is key to the safety and performance of your trampoline, finding the correct trampoline mat may seem daunting, however, it can be an easy process with only three key pieces of information after measuring your trampoline. The first being your trampoline's frame diameter, then your spring (or v-ring) count, and finally the length of your springs measured from hook-end to hook-end. If you are missing any combination of these three pieces of information, the likelihood of a product return or exchange due to errors increases.